Russia is delaying the return to Earth of three space station crew members by about a month in the wake of the failure of a Russian Progress supply ship that spun out of control moments after reaching orbit April 18. Launch of three fresh crew members also will be delayed, from May 26 to late July. Space station commander Terry Virts, European Space Agency astronaut Samantha Cristoforetti and Soyuz TMA-15M commander Anton Shkaplerov had planned to undock from the International Space Station Wednesday afternoon (U.S. time), setting up a touchdown in Kazakhstan to close out a 171-day mission. Instead, Roscosmos, the Russian federal space agency is delaying their return, and the launch of their replacements, to give engineers more time to complete the Progress failure investigation, to implement possible corrective actions and to accelerate processing and launch of another Progress supply ship. While the Virts crew could have returned to Earth on schedule this week, that would have left the station with just three crew members -- NASA astronaut Scott Kelly, Mikhail Kornienko and Gennady Padalka -- for an extended period. Russian managers opted to keep Virts, Cristoforetti and Shkaplerov aloft for an extra few weeks to ease the near-term workload and to shorten the gap between their departure and the arrival of their replacements. While the Russians did not announce a date for the Soyuz TMA-15M entry and landing, sources say June 11 appears favorable based on the station's orbit. Assuming that schedule holds up, Cristoforetti, making her first spaceflight, will set a new record for the longest single mission by a female, eclipsing U.S. astronaut Suni Williams' 195-day total on June 7. 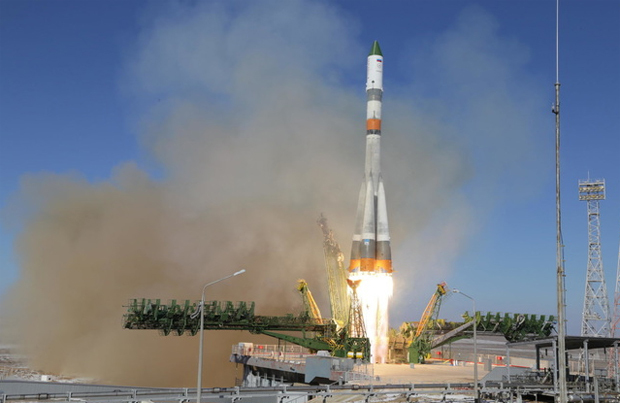 The Russians had planned to launch the Soyuz TMA-17M ferry ship on May 26 to carry spacecraft commander Oleg Kononenko, Japanese astronaut Kimiya Yui and NASA astronaut Kjell Lindgren to the lab complex to boost the crew back to six. That flight now is on hold until late July. In the meantime, the Russians hope to accelerate processing of another Progress supply ship, moving launch of the M-28M/60P resupply spacecraft from Aug. 6 to early July. A U.S. resupply mission managed by SpaceX remains targeted for June 19, but sources say that flight could slip a week or so due to unrelated issues. The Progress mishap that threw a wrench into Russia's crew rotation schedule occurred April 18 when a malfunction of some sort toward the end of an upper stage rocket firing damaged the M-27M/59P cargo ship just before or during spacecraft separation, imparting a rapid spin. Russian engineers were never able to gain control and the cargo ship, carrying 3 tons of supplies and equipment intended for the space station, was destroyed May 8 when it plunged back into the atmosphere over the Pacific Ocean. The Soyuz booster used to launch uncrewed Progress supply ships and piloted Soyuz ferry craft are not identical, but engineers want to make sure whatever caused the Progress failure is corrected before attempting another launch. Roscosmos did not address how the Progress failure and the Soyuz TMA-17M launch delay might affect additional downstream flights other than to say the next flight in the sequence, Soyuz TMA-18M, carrying cosmonaut Sergey Volkov, ESA astronaut Andreas Mogensen and British singer Sarah Brightman, was expected to remain on schedule. Kelly, Kornienko and Padalka blasted off from the Baikonur Cosmodrome in Kazakhstan on March 27. Kelly and Kornienko plan to spend nearly a full year aboard the outpost, but Padalka plans to return to Earth in early September. He will join Mogensen and Brightman aboard the Soyuz TMA-16M spacecraft for entry and landing in Kazakhstan. Volkov will remain aboard the space station as part of its long-duration crew. He will return to Earth next March with Kelly and Kornienko aboard the Soyuz TMA-18M ferry craft.